October 9 marks 55 years since Uganda’s independence in 1962. The country’s economy has seen many changes during this time, affected by periods of political instability, civil war, fluctuating global commodity prices, and various economic reform. October 9 marks 55 years since Uganda’s independence in 1962. The country’s economy has seen many changes during this time, affected by periods of political instability, civil war, fluctuating global commodity prices, and various economic reforms. Trends in recent years are positive, although some key challenges remain. Economic data for the early years after Uganda’s independence is scarce. But economic growth appears to have been impressive for the first eight years. Agriculture dominated the economy, with cotton and coffee comprising 76% of exports. Five years after Uganda’s independence it joined forces with Kenya and Tanzania to form the East African Community, with the intention of creating a common market. In 1971 Idi Amin overthrew President Milton Obote in a military coup and Uganda went into rapid political and economic decline. “Foreign” economic interests were eliminated and some 70,000 residents of Asian and European descent were expelled from the country. Firms and factories that had been the backbone of Uganda’s economy were expropriated. This, combined with Amin’s massive military spending, sent the economy into free fall. External debt climbed and Uganda’s investor confidence was shot. Regional relations deteriorated and the East Africa Community was disbanded in 1977. 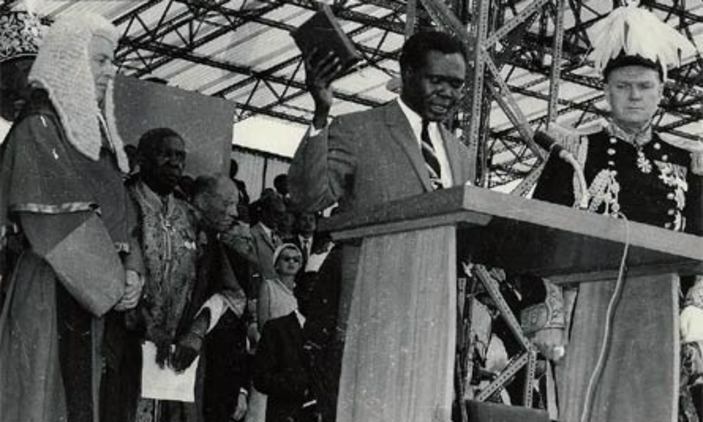 Amin was finally overthrown in 1979 and Obote took over the presidency again.  Uganda’s economy had been devastated and significant economic reforms were needed. This involvedremoving price controls, floating the exchange rate, and tightening government spending. Owners of expropriated firms and properties were encouraged to return. After five years of civil war, Yoweri Museveni and the National Resistance Movement (NRM) took power in 1986. The economy was in deep recession. With International Monetary Fund support, the NRM undertook major economic reforms aimed at encouraging private sector growth and diversifying Uganda’s agricultural exports. Uganda’s over-reliance on a small number of agricultural exports, notably coffee, had left the economy vulnerable to fluctuations in production and swings in global commodity markets. Under these early reforms, the Ugandan shilling was devalued and budgetary constraints were adopted. Inflation, which had peaked at 190% in 1987, was brought down to 26% by 1991. Additional reforms further limited government spending and borrowing and significantly reduced the size of the civil service and the army. Over the past two decades, Uganda’s economy has developed in important ways – dependence on agricultural exports has eased, the services sector has grown, and regional trade and integration has strengthened. But there are still major weak spots, including a weak manufacturing sector and constraints on small and medium sized enterprises. 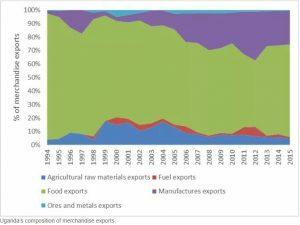 Some progress has been made in diversifying Uganda’s agricultural exports and, although still dominated by food exports, the share of non-food merchandise exports has been increasing in recent years (see Figure 1 below). Exports of agricultural raw materials and ores and metals exports have declined, indicating that greater domestic value addition is taking place. The composition of Uganda’s economy has changed quite significantly over the past few decades (see Figure 2 below). 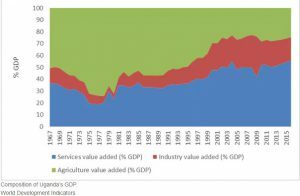 Agriculture’s contribution to GDP has shrunk, although it continues to employ some 70% of Uganda’s labour, and the share from services has increased from 19% in 1977 up to over 55% today. Industry’s share has also grown since the sector’s collapse in the early 1970s, but its growth has been more muted. Within industry, manufacturing’s contribution to GDP has remained stagnant at around 8% for the last 15 years. Uganda’s manufacturing sector is small and dominated by micro, small and medium enterprises, which make up some 93.5% of the sector, with agro-processing being a particularly important activity in the sector. These small firms are limited by a number of constraints including lack of access to high quality inputs, reliable and cost effective electricity, and affordable credit. As a result, they struggle to achieve the economies of scale needed to grow and increase their productivity. Under the NRM, Uganda has experienced positive, albeit fluctuating, economic growth (see Figure 3 below). Growth of the services and industry sectors shows important progress towards structural transformation, shifting labour out of less productive agriculture and into more productive sectors. Population growth, however, has remained high, averaging 3.4% since 2010. This has lowered net growth rates (economic growth less population growth) and eroded potential improvements in living standards. Indeed, Uganda’s population growth has meant that GDP per capita growth has been on the decline in recent years. In contrast, Kenya and Tanzania have had lower population growth averages since 2010. In Kenya it’s been 2.7% and in Tanzania 3.1%. Both countries remain on positive and higher GDP per capita growth trajectories. The East African Community was revived in 2000 and regional integration has made significant strides since then. A customs union and common market have been introduced. Among other benefits, regional trade has been shown to promote regional peace and bring economic development to border areas. Further integration, such as greater transport connectivity, could offer important advantages. Continued growth of the services sector should be promoted. Attention should also be given to supporting manufacturing sector growth as it has the potential to create many low-skilled jobs. Easing the constraints faced by small and medium sized enterprises would facilitate firm growth, increase productivity, and raise manufacturing’s contribution to GDP and exports. To increase Ugandan firms’ competitiveness it’s critical that production capacity is raised through training programmes and by matchmaking domestic suppliers with foreign firms. And firms need unrestricted access to high quality inputs if they’re going to be able to move into the export market. 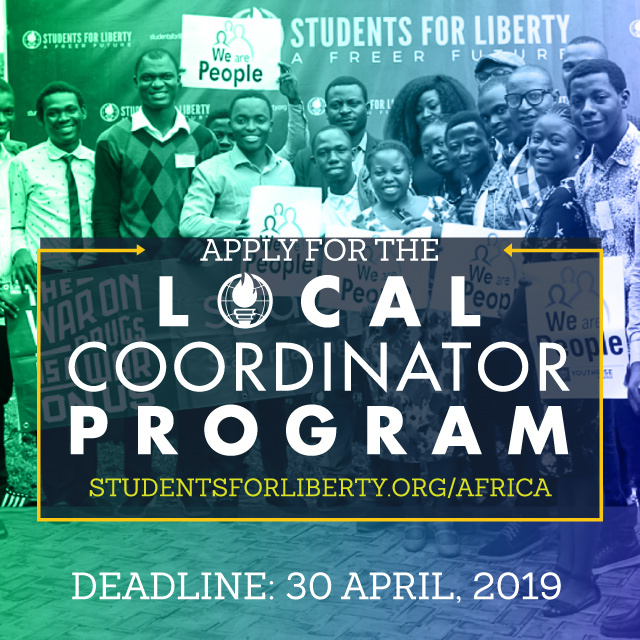 The Ugandan government has an important role to play in supporting these efforts and, with government commitment, considerable economic gains could be achieved. This article first appeared on The Conversation. It is reproduced here under a Creative Commons license.